No matter what kind of wedding you have, there really should be food. And your options are fairly unlimited, from hot dogs and hamburgers at the beach, caviar and champagne in a magnificent ballroom to a variety of food trucks. This can mean doing hours of research to find the right wedding caterer to fit your wedding theme. Or, you can check out our selection of local caterers, which can save you time while introducing you to the best caterers in your city. You should book your caterer after you have a decent guest count and have booked your venue. ##Your caterer should be able to handle both a sit-down dinner as well as a buffet. If you like a caterer that seems out of your price range, ask about doing a breakfast or brunch instead of a dinner. A large selection of tasty appetizers can save you money on the main course. Don’t be afraid to be different. Everyone has had the wedding chicken or fish, and there are lots of other delightful options. Tacos, anyone? 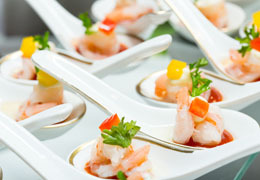 ##Review our selection of caterers at Weddingventures.com until you have narrowed down your search. Then check out their information and their specialties. A spread of Chinese food can be different and very appreciated. Find out if they are full-service and will help with other aspects of your wedding reception. A caterer can do more than just prepare food. He or she can provide tables, chairs, linens, china, and glasses. Many will set up the tables, provide waitstaff and bartenders, as well as alcohol and wedding cakes. Our handy list of wedding caterers makes selecting the caterer that is right for you easy. ##Be sure to ask specific questions, such as what happens to the left-over food. Some caterers provide boxed take-out, which will be especially appreciated by out-of-town guests. ##Most importantly, make sure they offer a food tasting. You don’t want any unpleasant surprises during your wedding reception. 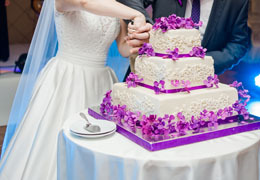 At Weddingventure.com, you will find the best wedding bakers in your area. Usually, your wedding cake is the first thing guests notice at your reception, so you want it to stand out. Let your wedding baker create a perfect work of art. ##Narrow down your search for the perfect wedding cake that suits your wedding style. Whether elegant, whimsical, or modern, your cake should blend into your wedding décor and palette. There is more to selecting a wedding cake than deciding between vanilla and chocolate. Tiered cakes can provide more than one taste sensation, so don’t be afraid to experiment with different flavors. Your wedding theme should determine the design and color of your cake. The cake should reflect your overall wedding colors. ##The cutting of the wedding cake by the newly-married couple is an old tradition. It symbolizes their togetherness. This is something you don’t want to miss. Some couples prefer a smaller cake specifically for the cutting ceremony and a larger one for the guests. ##Click through our large selection of wedding bakers until you can narrow down your selection. From single layer to a grand design of the Eiffel Tower, you will find a wedding baker you can work with. When you do, make sure to arrange for a taste test. You want to make sure the taste matches the cake’s gorgeous looks. Find out if your baker delivers, or do you have to pick up the cake? You want bartenders and waiters who know how to work an important event. Personality and experience count. 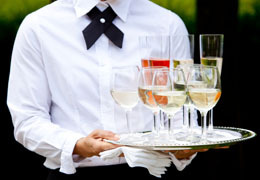 Our waitstaff and bartenders will ensure that your guests receive first-class service throughout the reception. ##A good bartender adds to the overall experience of the event by interacting with the guests. Hiring a professional, licensed bartending service provides you with control over the flow of liquor. He or she can specify rules regarding the cut-off point for drinks for those guests unable to this for themselves. This creates a much safer atmosphere than having a friend pour alcohol indiscriminately. ##Our selection of professional bartenders can also help you create an alcohol menu, including special cocktails, ensuring that your wedding reception is truly memorable. ##A professional waitstaff is equally as important. They will set up the tables, replenish beverages, refill the buffet, and clean up after the event in an unobtrusive way. Their contribution to a successful wedding reception is all-too-often overlooked. ##You want someone who will deliver the right order to the right person at the right time. Imagine something clanking dishes across the room while the best man is making a speech. It will certainly ruin the moment. Don’t let that happen.